Spring some refreshing ideas into your home with these finds. Minimalistic and modern made warm and inviting for this busy family. Northern Iron creates authentic iron lighting, furniture and art. A custom build readies homeowners for retirement. Local business pros know the tricks of the trade. 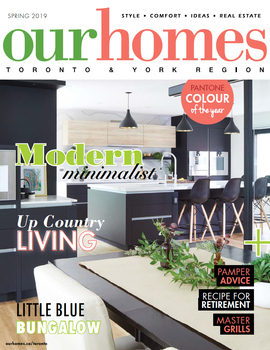 Check out an awardwinning development north of Toronto. Build a beautiful bath with the team at Canaroma. A bungalow reno goes from dated to divine.